About Us - Scott Springfield Mfg. Who is Scott Springfield Mfg. Inc.? Scott Springfield is an innovative leader in custom designed air handlers. Based in Calgary, AB Canada, we use the latest technologies to design and manufacture high quality custom air handlers. We provide our clients with a flexible design approach to meet their expectations. Scott Springfield optimizes equipment designs to fit the end user’s requirements. Designs take the entire system into consideration, not just the air handler. Even flow profile throughout the air tunnel, effective air mixing to minimize stratification, reduction in internal pressure loss, quiet operation, casing integrity, indoor air quality, building automation, maintenance, unit location are just the start of our approach to building quality equipment. Because medical facility designs differ from oil and gas facilities, our staff must stay on top of the most current requirements in a variety of markets. Our fabrication and assembly processes are designed to apply LEAN manufacturing techniques to our custom manufactured products. Scott Springfield’s ISO Certification ensures repeatable high quality on every unit we build. The result is an extremely high-end product at competitive prices. Scott Springfield’s dedicated employees hold themselves accountable too. Our Continuous Improvement Program (CIP) for engineering, manufacturing, sales and administrative processes focus on providing our team the ability to build the best products and maintain a high degree of customer satisfaction. Whether your needs are energy recovery, explosion proof, classified, custom packaged technologies or any of other design options we offer, Scott Springfield can help you meet your application. Our fabrication and assembly process is designed to apply LEAN Manufacturing techniques to our custom manufactured product. The result is an extremely high-end product at competitive prices. Scott Springfield is able to achieve highly repeatable results by requiring employees to attend continuous training programs. Production and engineering staff work together as units are constructed to maintain the design engineer’s intent. In addition to being an ISO facility, Scott Springfield is also a Canadian Welding Bureau certified facility. Maintaining our certification means that we must follow the most stringent codes and standards set forth by CWB as well as pass periodic recertification testing. Scott Springfield’s Engineering team pulls together years of experience in mechanical and electrical design to bring to our customers a product that fulfills the performance, durability and serviceability requirements needed in a custom air handler. Keeping abreast of industry design standards, we are continually striving to improve the product offering at a competitive price to the market. Our team of engineers and technologists – who specialize in mechanical design, controls and programming – continue to look for solutions to exceed your specific needs. Scott Springfield’s engineering department is also responsible for working with outside agencies such as IBC, Intertek and various industry, local, state and federal agencies to meet design guidelines. Our sales and marketing department is comprised of Industrial and Commercial groups who are experts in these field. Industrial projects are designed and managed through our headquarters located in Calgary. Commercial projects are managed through our Commercial Group and our Rep Network located throughout North America. For more information on who to contact for your project, visit our Rep Locator. SSM believes in empowering our representatives with the latest design tools. For this, we created Scott Springfield Selector™ – our in house selection program. 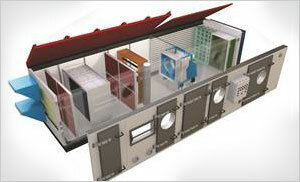 With S3, our team is able to design custom air handling equipment for just about every application. We are available to present our products to consultants, contractors, facilities and owners. Give us a call and let our team of experts help you with your application.